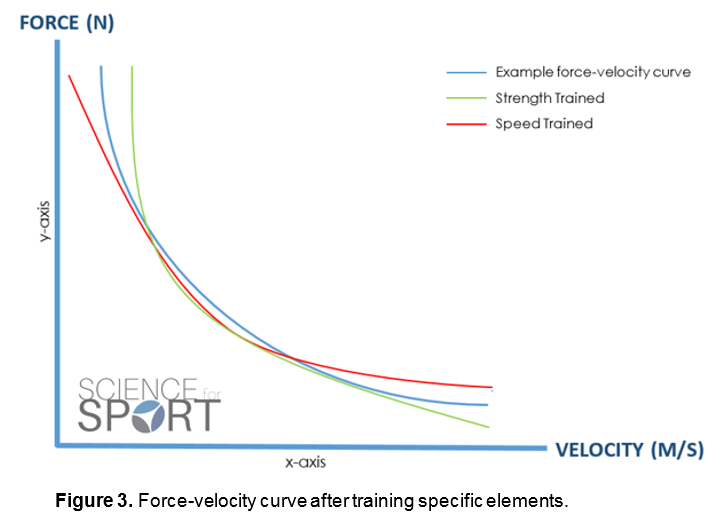 The Force/Velocity Curve – Train Your Weaknesses – Outlaw: Strength | Fitness | Rehab. Yesterday on Instagram, I shared a post from Eric Cressey that talked about what should be the bedrock foundation of every strength and conditioning program. One thing I hope all my athletes understand is the relationship between force and velocity. As we assess every athlete we look at what type of physical traits they have and put them in three categories. Once we identify the type of athlete we are looking at we can see a very clear picture of what they need to train in order to maximize their athletic potential. To do this we plot each athlete on what is called a Force/Velocity Curve. This is a graphical representation of the speeds at which an athlete creates power based on the weight they are moving. For the Force/Velocity Curve, force represents strength and velocity represents speed. My job is to shift the Force/Velocity curve to the right in order to improve the athlete’s ability in the areas they are deficient in order to improve their entire athletic potential. An example of this would be a 150lb High School wide receiver that runs a 4.6 40yd Dash but only squats 1.5X their bodyweight (225lbs). This is an athlete that needs to have more strength based training in their program in order to increase their force. By increasing above athletes force they are able to move heavier weight faster and thus shifting the Force/Velocity curve to the right. Now, being that I work with a ton of young athletes, a lot of new clients come into my program with very little that distinguishes their speed or strength. In this case, we attach both qualities and see how the athlete develops. Over the course of training, we can see what traits become dominate and make adjustments as we go. For athletes looking to improve their on-field performance, it is vital for them to understand the Force/Velocity Curve and approach their training with a plan to shift the curve to the right. If you have the correct plan your strength and speed with go through the roof and you will see phenomenal training results.